This southern Spanish capital is famous for its historic churches and palaces, Moorish buildings, flamenco dancing, and more. Whether you're interested in tapas or history, there's no chance you'll get bored in this Andalusian city. The heart of Seville's tourist district, Santa Cruz is easily one of the most beautiful barrios (neighborhoods) in the whole of Spain. This neighborhood is home to many sites, including the Seville Cathedral, and the Real Alcázar, a palace with gardens. You can spend hours in this neighborhood alone, visiting tapas bars or jumping from shop to shop, looking for handicrafts and ceramics. Also known as the Cathedral of Saint Mary of the See, the Seville Cathedral is one of the city's most beloved landmarks. The Roman Catholic cathedral is a UNESCO World Heritage site and is the world's largest Gothic cathedral. Don't skip a visit to the adjoining Alcázar palace, which has stunning gardens. The cathedral is typically open every day, but hours vary, especially during the summer months. General admission is 9 Euros, as of February 2019. The Giralda was once a minaret of a mosque that stood on the site of the Seville Cathedral, but now it's cathedral's bell tower and it's open to you to climb. In addition to the stunning views from the tower, the Giralda is also an excellent example of Seville's unique architectural styles: You can spot Moorish, Spanish, and even Roman influences. Admission to the tower is included as part of your ticket to visit the cathedral. If you're a fan of "Game of Thrones," you'll immediately recognize the Real Alcázar de Sevilla. But even if you're not, this incredible royal palace is worth a visit. Built for the Peter of Castile, a Christian king, the Alcázar was constructed on the site of a Muslim fortress. You can still see blends of the unique cultures and design today. The Alcázar is open seven days per week, except for Christmas and a handful of other holidays. Admission is 9.50 Euros as of February 2019. Cadiz is an easy day trip from Seville, taking just under two hours by train. The ancient port city is home to the Spanish Navy and was once a bustling port for trade and exploration. Today, you can visit one of more than 100 watchtowers, the most iconic of which is the Torre Tavira. The city is also home to the 18th-century Cádiz Cathedral. Seville is famous for flamenco, but a few places are better than others for catching a performance. Each tablao has a different style, but regardless, you'll end the night feeling exhilarated. Casa del Flamenco is one of the most popular venues, set in an Andalusian patio. There is no food and drink, so if you want to imbibe while watching a performance, head to Los Gallos instead. The venerable Restaurante Enrique Becerra is one of the finest tapas bars in Seville. The third-generation proprietor cooks up classic Andalusian fare with market-fresh ingredients. There's also an ample list of wine, especially sherries from nearby Jerez. You don't actually have to see a bullfight: If the history of bullfighting is interesting to you, visit the bullfighting museum at the bullring. The oldest bullring in the world, Real Maestranza, has an adjacent museum that includes costumes, photographs, and paintings dedicated to the spectacle. Note: Bullfighting is deeply rooted in global historic traditions. But today, local public opinion leans against the tradition. Though the site includes information for tourists interested in attending the events, TripSavvy trusts its readers to make their own decisions on the ethics of bullfighting as an attraction. 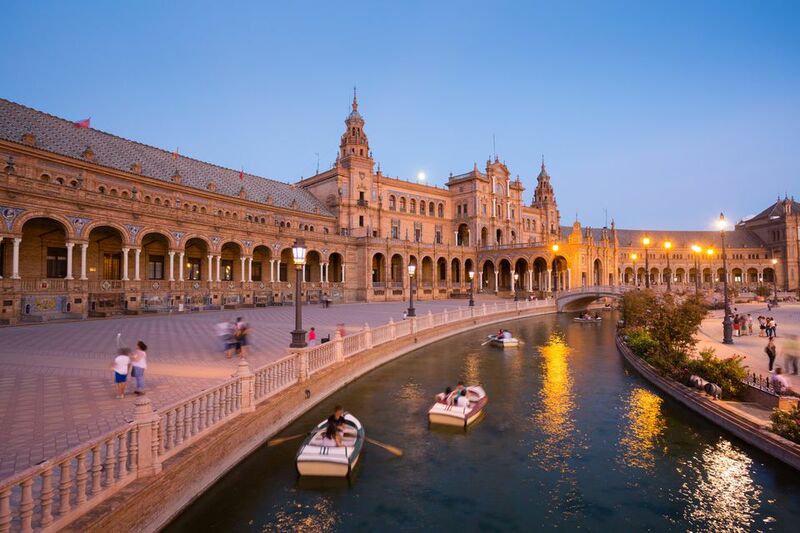 The Plaza de España is easily the most beautiful and extravagant plaza in Seville. Situated in the Parque de Maria Luisa, it was built in 1928 for the Ibero-American Exposition. The landmark blends Renaissance and Moorish Revival architecture styles. Today, it's a great spot for people-watching and general leisure. The Sevilla Dance Center is a successful dance school in Seville's old town. Here, you can learn about many popular styles of dance, including flamenco, of course, but all classes in jazz, ballet, modern, and more. This is one of many traveler's favorite parts of Seville. The square is home to Iglesia de Omnium Sanctorum, an understated 13th-century church, a lively market, and a number of modest bars full of families who spill out onto the streets to enjoy the afternoon. Seville's fine art museum showcases art from the Gothic era to the present day. The museum is housed in a 16th-century building that was a convent in the past. Today, it includes works by many of the great masters, including the likes of Goya and Murillo. The Murallas de Sevilla is a series of defensive walls that are built around the city. The walls date back to Roman times but have been updated, destroyed, and repaired countless times over the past hundred years. They're among the oldest sights in Seville. If you have kids, it's worth a visit to Isla Magica, a theme park built on the grounds of the Worlds' Fair. The park opened in 1997 and includes rollercoasters, entertainers, and more. Jerez is an easy hour drive from Seville, making it a great day trip. The city is well-known for its sherry wine, a fortified wine that is among the most popular aperitifs in Spain. A visit to Bodegas Tradicion includes not only a tasting of four excellent varieties of sherry but also a tour of the on-site art gallery and snacks.